Sandra & John With Viper, Elder, Glen Front, & Indiana. Welcome to our web site,hope you enjoy looking at our dogs and what we have to offer. Occasionally we do have fully trained Labradors for sale, please give us a ring if that is what you are looking for Tel 01254 831363. Very occasionally we do have older retired MALES wanting a home,these are dogs that have been trained, competed in trials and used at stud. They are usually over eight years old. We have been breeding and training labradors for the past 50 years. All our dogs are shot over regularly and we go picking up as much as we can. 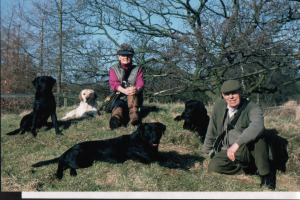 John has now retired as the captain of the England Gundog Team, after 15 years,you may have seen us at the C.L.A. Game Fair. Sandra still likes to compete in Working Tests and Field Trials throughout the shooting season. We have won the Retriever Championship on five occaisions, John winning it three times in a row with FIELD TRIAL CHAMPION BREEZE OF DRAKESHEAD in 1985, 1986, 1987,a feat never before accomplished. He then went on to win it again in 1992 with FIELD TRIAL CHAMPION RAUGHLIN PETE OF DRAKESHEAD. Sandra won the Championship in 1979 with FIELD TRIAL CHAMPION WESTEAD SHOT OF DRAKESHEAD. Between us we have made up 31 FIELD TRIAL CHAMPIONS and bred many more. We are both FIELD TRIAL(A) panel Judges, Sandra is also a CHAMPIONSHIP SHOW JUDGE for Labradors. We used to do six/seven Gundog Training Demonstrations up and down the country each year, you may have seen us at the country fairs. Occasionally we do have puppies for sale, but you would need to order well in advance. Puppies are also available by our Stud dogs see the puppy page. We always have TOP CHAMPIONS AT STUD, have a look at them ON THE stud page. Thank you for looking at our web page, do hope you enjoyed it, we are here to help you.